Some people are very clear about their career preferences; they try to be focused more about their particular job requirement in their preferred field of work. Similarly, some people only try to get into a government sector because they believe it is one of the career preferences which provide greater job security for a lifetime. Therefore, such people try to get a job in government offices, it doesn’t matter what post they want to work in. But the only thing that matters is that they want to work for the government sector. There are many multinational companies which are paying their employees good salary along with great perks, but many people especially youth still prefers government jobs more than working in these private sectors. Be it any government job or private job, there is one common hindrance which everyone has to face, that is nothing but entrance exam. Cracking the entrance exam is not that easy, but with dedication and hard work, we can surely get through it successfully. Create a schedule for preparing for your exam and work on it accordingly. How to Get a Government Job? There are several different sectors available in each and every government department. And before making a move towards such government department, a person need to be sure of the field of work where he would like to join in. Try to acquaint yourself with the various departments and headquarters that the government has, which has its own set of target, missions and mottos. Make sure you go through these various departments and choose one that you think is the most suitable for you. This job might also be a great help in showing your full potential and abilities which can make you an ideal government employee. This also allows you to see the bigger picture and explore about the various jobs and positions that the government presents. It is one of the important steps to get into a government job. Without knowing the field of work or the particular field where a person would like to work in the government department is considered as a complete waste of their time. Getting a job in a government department is not that easy as it seems. Dreaming about getting a job in the government sector is one of the dream where the possibility of fulfilling that dream is very minimal. As all people know about the work process of the government department which undertake several background checks in different field of work. Similarly, when it comes to get a job in the government office, a person need to go through several tests and screening and to clear all those tests, a person need to have a positive attitude towards his efforts. Moreover, some candidates might hear and might come to know that the number of government jobs is decreasing year by year, so do not be disheartened and try to think that there are a large number of jobs that are still waiting to be searched and applied for. So try to look for the right kind of job, by searching through online and offline resources. For this to happen, it is required that the candidate should be positive and should have an optimistic approach during the whole job searching process. When a person made up his mind towards government job and ready to put in all his efforts and hard work to get him selected as one of the government employees, then firstly he should start looking for a government job using different job searching tools. Try to find out more about the jobs and positions that you are interested through various job posting sites such as monster.com or could get any information about various job postings by contacting the national employment exchange or by constantly checking the government job sites for an effective result. Also, try to find the jobs that you like with respect to the area and location. Most probably a person needs to keep track of all the updates about government jobs available in their particular area and region. Moreover, after finding out the required field of work, then that person should apply for that job following government rules and regulations. It is possible that after applying for the job using job search tools, a person might receive an early interview call from the government department. And at that point of time, the candidate needs to start gathering information about the position offered in the interview application. Try to find out what the department does and how is it beneficial to the government. Also research about the various positions that the departments have and also enquire about what they do and also the perks and privileges that the government provides for each designation. Therefore, it is necessary for each and every candidate applying for the government job that they need to be well researched with their interview possibility. After you have decided on what field or branch of the government and IT organizations you want, start looking out for any types of notifications related to it through various employee websites or through the government job sites itself. So stay tuned for any type of news or notification, whether it is in the upper government sector, public sector or even the foreign service sector. Keeping an eye on the news will help you be prepared and ready for future job interviews. It is not easy to clear government interview. And unlike the rest of the company conduct some common interview sessions, the government department organizes special tests and screening for qualified candidate. Therefore, if a person need to clear out all those tests, then he should start preparing for those tests well in advance so that he can pass through all those interviews stages. Moreover, preparing for the tests also helps in the increase of knowledge as well. Working in a government department is not an easy task to get it done; some people even have to leave everything for such a prestigious post of work. Therefore, it is possible that some people seek help from their networks so that they get that post in the government department. While applying for the government job a person need to keep in mind that he should be careful of false information on the resume. Sometimes it happens that because of false information on the resume a person might get into legal trouble for the rest of their life. And that is why if a person want to apply for the government job, then they should reformat their resume with all the truthful information which may not seem offended for the government officials. It is possible that waiting for the interview call and waiting for the interview sessions might seem really exhausting. But the truth is that if a person really wants a job in a government department then he should learn how to be patient throughout the interview sessions. Therefore, being patient can bring out the level of passion for the post in the government department. And finally, that person might get selected for the job offered by the government. One of the important things that the candidates need to keep in their mind is that before applying for the government job, they should have certain eligibility for the job. And that eligibility can be made by the government department or by the constitution of the government. Therefore, it is compulsory to follow all the provided government norms for the welfare of the government and its activities. Moreover, people might even get punished if they disobey the government rules when it comes to recruiting employees for the department. Although the idea may sound cheesy and old, but applying yourself to the nearest national employee exchange can help you land a government job. All you have to do is go to the most nearest office of the national employee exchange and get yourself registered. The whole registration process usually takes about a day to a few hours and the registration process will most probably be completed within the same day itself. After registering there might be chances that you might get a call from the employee exchange, because the government officials have called you for a job that is suitable based on educational requirements and skills. So if you haven’t registered yourself to the national employee exchange, the safest bet is to register yourself right away. As a potential job seeker, it is necessary that you are reading the newspaper and going through various news sites every day just to keep on track with the historical and current affairs and also expanding your general knowledge. You can also take an extra step by noting down the different national and international affairs that have occurred in the varying fields of science, politics, and economy and also among social life like movies and social affairs. Make sure to note down the details that you learn about in a book and make it as your personal general knowledge book. Ensure that you know the important names and dates and also know the important historical dates. This is an important step that you have to do in order to have a good chance of getting the job while preparing for government job exams. The main reason being that along with logical and analytical reasoning, a good amount of general knowledge and current affairs is also asked. It is a fact that almost all the government related jobs and its exams include logical, analytical and numerical reasoning as one of the main factors so as to select candidates for the job posted. So, it is necessary that you try to develop such skills and abilities every day. This can be done by doing questions related to reasoning and analysis every day and practice them whenever you can. Another factor that needs to be noted is the time management. This is because most of the less prepared candidates forget how to manage their allotted time while doing mathematical and logical reasoning questions. It is necessary that most candidates should have good and sound knowledge about Basic English and they should be able to have good communication skills, which is sufficient to keep up a conversation in English. Having good English skills can have two advantages one being that the selection exams for most of the government jobs present English questions in the same level of priority as logical and reasoning questions because they feel that having good English skills is also as important as having a proper analytical reasoning and logic. Without any doubt, government jobs are the best career choice as per the majority of job seekers. The primary reason is that government job gives your security and also several other benefits which can make you lead your life happier and prosperous. As the competition for these government has intensed, the selection process of these jobs have also made tough. So if you want to get into the government job, you need to perform well throughout the selection process and especially in the job interview. The interview tips which we have mentioned are completely unique and also tried and tested ones. Following these tips will surely help you crack through the job interview successfully. Another reason being that after you have passed the preliminary tests and exams, you might be called for an interview for the second stage of the selection process. Here, the candidate is expected to have a foundational knowledge in English and they should able to keep up a basic conversation completely in English. They might also be called out for group discussions where the candidate has to impress the interviewers by raising and stressing on important facts and points said during the general discussion. 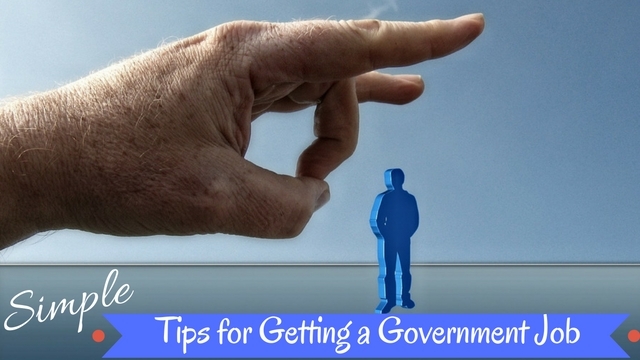 Finally, the bottom line is that this discussion over all the necessary tips to get a government job can definitely provide useful information about the government interview requirements. Therefore, interested people who are trying to get a government job or those who are preparing for the government job from very long time, should follow all the above-mentioned tips to get selected for the post offered by the government.